Do you have a favorite Easter candy that you wait all year for it to make its debut? Do you get so excited about it, you overbuy? I admit, I have been guilty of this a time or two. My favorite Easter candy is the Pecan Egg and just about any and every Easter egg with caramel. Leftover Easter candy is not a bad thing. It’s perfect for an afternoon pick-me-up. Leftover Easter candy can be stored in the fridge for a cool treat or even frozen….if you have that much will power. This week for my TV segment, I chose to do leftover Easter candy to help me get all the goodies out the house because… I have no will power. When placed inside biscuit dough and baked, the candy melts into a ooey-gooey luscious center. Use buttermilk refrigerated biscuits-Roll or pat out to form a 4-inch circle. Put a Cadbury Cream Egg or Peeps in center. 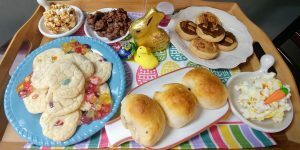 Bring dough up to enclose candy completely. Pinch ends to seal. Place on baking sheet, seam side down. Bake on middle rack of oven for 8-10 minutes, until golden brown. TO COOK IS TO CREATE: Really have a sweet tooth? Top baked biscuits with powdered sugar. Don’t care about calories? Brush biscuits with melted butter and sprinkle with cinnamon before baking. What other candy do you have? Try it. 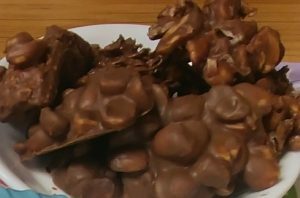 Melt your favorite Easter candy in a double boiler. 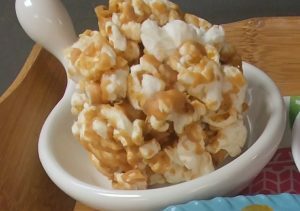 Stir in prepared popcorn until evenly coated. When cool enough to handle, shape into balls and place onto wax or parchment paper. 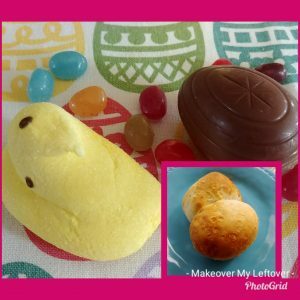 My favorites are any caramel eggs and peeps! Preheat oven to 350*. Mix all ingredients together well. Drop by teaspoons two inches apart onto ungreased cookie sheet. Bake 8-10 minutes. 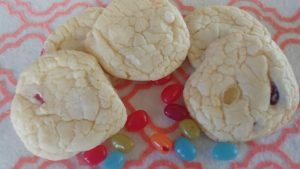 TO COOK IS TO CREATE: Think about using other flavored cake mixes and different jelly bean combinations. 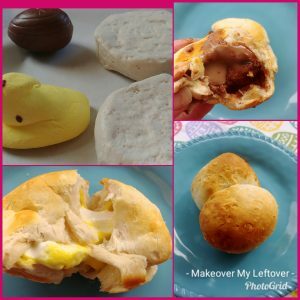 Break apart chocolate bunny or chocolate caramel eggs. Add to double boiler. Slowly melt. 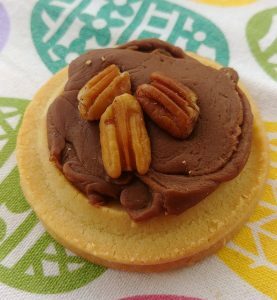 Spoon melted chocolate onto center of store-bought shortbread cookies. Press pecan pieces onto melted chocolate. Let cool. TO COOK IS TO CREATE: Not a shortbread cookie fan? Top vanilla wafers or graham crackers. Don’t like pecans? Try walnuts. Add jelly beans and water to a small glass container. Microwave 30 seconds. Add jelly bean juice, vodka or gin, and ice to a cocktail shaker with strainer. Shake until cold. Pour into martini glasses. Drop jelly beans in bottom of glass, optional. 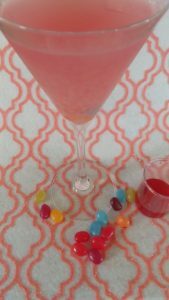 TO COOK IS TO CREATE: Think about all the different flavors of jelly beans and possibilities of flavors or just mix them all up for a sweet fruity martini. Use the jelly bean juice to make a non-alcoholic drink, too, just add to sprite! Break apart chocolate bunny. Add to double boiler. Stir until melted. When melted, mix in desired nuts, pretzels, shredded mini wheats, or chex cereal. Drop by tablespoons onto waxed paper. Let sit until hardened or chill in fridge for a quick snack. In double boiler over medium heat, break apart chocolate bunny. Add equal parts room temperature brewed coffee. Use a rubber spatula to stir and slowly melt the chocolate. Keep stirring until smooth. Remove from heat, stir in 2 TBSP Irish Cream Liqueur. Let cool. Once cool, whisk in 8 oz masarpone cheese, a little at a time, until all incorporated. 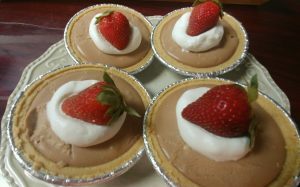 Spoon mixture into individual graham cracker pie crusts or baked tart shells. Chill at least 2 hours. Top with fresh whipped cream and strawberries or blueberries, drizzle with melted chocolate, or dust with powdered sugar before serving.